Our family loved meeting some fun characters on our recent trip. Whether meeting characters is your top priority or just a nice enhancement to your Disney vacation, it’s good to plan beforehand. You make reservations for food and secure your fast passes, why not put the same level of effort into the characters you meet? It’s easy to get wrapped up in the hunt and lose a lot of your vacation time finding and waiting for these characters, so here are some Tips & Tricks for Meeting Characters at Walt Disney World. Some character meet and greets offer Fastpass+. Save yourself a lot of time by securing your plans in line for popular meet and greets. Mickey and Minnie Fastpasses can be claimed for Animal Kingdom, Epcot and Magic Kingdom. Ariel and Belle have Meet and Greets in New Fantasyland. Rapunzel and others can be found in Princess Fairytale Hall in Fantasyland, and Tinkerbell has a location in Town Square. If you are making Character moments a big part of your disney trip, consider purchasing the Memory Maker package. You will get to keep all of the professional photos taken at character locations and on rides. It’s easier on you and you never miss a photo op. You can have the photographers snap a picture with your camera for free, but it’s better with the professional equipment. Study your maps and show schedules. They will let you know where characters will be, who they will be and when they will be there. Meet Greets are scheduled at permanent locations all over the parks. While you are moving around the park, stay alert for characters that might just pop up. Usually these are rarer characters and quite often they will pop up in Epcot either in front of the American Adventure or between the UK and Canada Pavilions. For more character fun without the lines plan on attending one or more dance parties. These are happening all over. There is an Incredibles Dance Party in Tomorrowland right now, Donald’s Dino Bash in Disney’s Animal Kingdom (with lots of great photo locations, too! ), and the Disney Junior Dance Party Coming this Fall to Disney’s Hollywood Studios. The Dance parties are a free part of your guest experience in the park. However, you can also buy tickets to after hours parties like Mickey’s Not So Scary Halloween Party. You can also buy an “Enchanting Extra” like Princess Tiana’s Ice Cream Social and Parade Viewing Party. Last of Course is Character Dining. You can eat and greet with characters at any of the parks and many of the hotels outside the parks, which saves the cost of park admission. The two best princess meals are Cinderella’s Royal Table in Magic Kingdom and Akershus at the Norway Pavilion in Epcot. Boardwalk, Beach Club, Polynesian,Grand Floridian, Contemporary, and Fort Wilderness all have character dining. It usually is “all you care to enjoy” family style or buffet, so don’t make another dining reservation too soon after a character meal. Which character at Walt disney World do you want to meet? We receive complimentary guide services from Michael’s VIPs to facilitate this post. All opinions are ours alone. Phew, it’s been just a few weeks since our big family Disney World trip, and we’re already missing it. As we look back and remember everything we did, we’re reminded how much we were able to fit into our time there – and it’s all because we had our ‘magical’ tour guide to help us out! 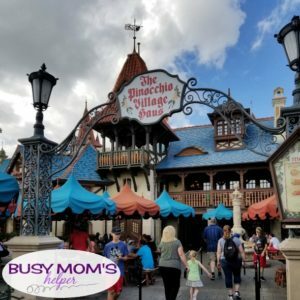 If you’re not sure if hiring private Tour Guides for Families at Walt Disney World is Worth it, check out our experience: you may realize that they’re worth every penny, and more! 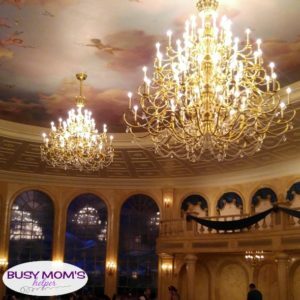 As a mom, my absolute FAVORITE thing about having a tour guide for families at Disney World is that she handles all the details – I didn’t have to check times or fast passes, or reservations. I was able to just go along and enjoy my time with my family, without the stress. What’s crazy is, you can’t really even tell she’s constantly checking everything! She’s right there with you, alert and in conversations, chatting happily with the kids – but she is constantly aware of the plan, ride wait times, upcoming parades or shows that could affect crowds and traffic, everything. Not only that, but we like to joke that Michael’s VIPs are ‘walking, talking maps’ because they know all the routes, where every ride and event is, and even where all the bathrooms are (and which are the best ones!). That’s really convenient for families, because if you have kids you KNOW there’s plenty of ‘I need to go to the bathroom’ moments! I realized that, since every time we were near one she’d ask if anyone needed to go, we didn’t run into the issue of emergencies or inconvenient potty breaks. That was super nice! I remember so many trips to Disneyland where we’d be far from a restroom, or about to get on a ride, when a kid just HAD to go. Not this trip, though! It’s fun how many little stories of bits of information the guides have – such as why Animal Kingdom has bathroom doors, unlike most of the other parks’ bathrooms (answer: in the very unlikely event a wild animal got out, people could get to safety in a restroom!). And if you do get a chance with a tour guide from Michael’s VIPs, ask about the ‘poop trail’ at Magic Kingdom. The kids still bring that up! Renee stayed with us each of the days up until we’d done pretty much everything, then let us decide if we wanted her to stay longer or if we were good to go redo things on our own however we’d like. I loved and appreciated the flexibility! These guys even go above and beyond so much – when one of our kiddos got a bit sick (from a ride or heat, we’re still not quite sure), and felt better sitting off one of the rides, Renee was happy to let her stay off with her so none of us had to miss it. She even bought her a drink to help her hydrate more. They TRULY care! Plus, they’re prepared – there were a few times she whipped out some pepto pills to help some of our more sensitive stomachs. At one of the lunches, we were happy to invite her to join us and the kids had a blast at the ‘fun table’ with her – so cute! The guides love kids, and are so patient with them. It’s their job to make your family happy and help you have the best vacation possible – but you can tell it’s not just their job, it’s what they truly love and care about your family. If you’ve read our previous experiences with Michael’s VIPS – when it was just my mom and I at our first time at Disney World, or last year when hubby wasn’t sure a guide was worth it for couples – then you know how great each and every time with them has been, despite being different groups and circumstances. Families are very different, but after this I’m convinced that our trip wouldn’t have been even nearly as good or enjoyable without Renee’s amazingness. What’s funny – day two with her and one of our girls was like “is Renee magic or something? How does she make it so we can do so much without any waiting?” Yup, these guides are magical – and priceless! It was a very sad ‘see you later’ when we parted ways at the end. The kids kept saying how much they missed Renee, and she was more than thrilled when we texted her a few days later letting her know that. When we WERE on our own, the kids kept commenting how it was a bit more frustrating and ‘boring’ because we weren’t as magical as her – there were more waiting in lines, and we may have gotten lost a time or two. We still had a wonderful time, but it was much easier, less stressful and we got to do a lot more with the help of our wonderful guide. You can read even more reasons to choose Michael’s tour guides here! Contact Michael’s VIPs for YOUR next trip to Walt Disney World – or Disneyland! Tour guides for couples – is it worth it? 7 things to NEVER bring to Disney World – and 10 you MUST! As many of you know, we went on a huge family trip to Disney World a few weeks ago. It’s been a couple years of planning and saving to take the whole crew, but it was completely amazing! I’ll be sharing a lot more details of our adventures, foods, shows, rides and more in the coming while, but today I wanted to tell you the overall fun from My Kids’ First Visit to Walt Disney World. Lots of pictures included, of course! One of the things I was most excited for with this trip was it was mostly NEW to the kids. While they’ve been to Disneyland several times, this was very different. We got to see their reactions to new rides, foods, characters, sites – even the themed hotel (All-Star Music) was new, so that started the trip off with lots of smiles and eagerness. We flew in, so they even got to experience the Magical Express! Visit Get Away Today for awesome prices on your vacation! My favorite part – SO MUCH FAMILY TIME! Yes, we all got a little annoyed or impatient with each other at some point during the trip (with that much walking, plus little sleep because so much fun, it’s bound to happen), but we were together practically every moment for the trip. We got to talk about things – not just about the rides or the vacation, but random learning opportunities (like forced perspective at Pandora, or vehicle topics at Test Track) and other fun conversations. We took many pictures together (yes, even with mom in there – yay! ), and even hubby and I made sure to get some time together on some rides or pictures. With the Epcot Food & Wine Festival going on, the kids got to try several new foods – not only there, but at the various restaurants and buffets. I was impressed with how many new things they were willing to try. For example, Thor loved clams, which I never would have thought! Plenty of desserts and treats were enjoyed by us all, of course – and we learned that on your birthday, you can get a free slushie at Club Cool in Epcot. If it’s your birthday while you’re there – go and enjoy! Be sure to visit Get Away Today for awesome prices on your vacation! Shopping with money they’d been saving for months was a highlight for the kiddos – the boys even shared in adopting a Banshee. We learned which kids have a tendency to spend as fast as they can, and which are more reserved and wait for the item that will make them happiest. Our wonderful guide Renee got us VIP seating at The Lion King Show, so the kids got to participate in some of the dancing and fun. (we received complimentary guide services for our trip) Seeing our kiddos interact with each other during the trip was also amazing – watching as they grew closer together and really enjoyed being a family was priceless! Other highlights included: catching Songbird’s face the very first morning in front of the castle (she’d never been to ANY theme park before) and her pure joy. Finding the exact same guy that did a fun caricature for hubby and I last year to do one of ALL the kids, and having that keepsake. Having the chance to share our FIRST experience in Toy Story Land together, remembering all those incredible films. We walked a TON, and slept a little. There were moments we’d catch some of the family sneaking in a quick nap – like hubby on the ferry boat. And yes, we made sure we tried ALL the transportation options at Walt Disney World, such as the resort shuttle, monorail and ferry boats. Like I said, many more details for all we did are coming up – but for now, I had to share a bunch of the happy times with y’all! What’s YOUR favorite thing about taking kids to Walt Disney World? Mobile Ordering started at Walt Disney World about three years ago in some select locations, and it rapidly expanded to many locations at all four theme parks. If you’ve ever used mobile order for your coffee, or other fast food during your morning commute, it is basically the same thing you’re already used to. You access the option through My Disney Experience, the phone app that helps you manage your itinerary, reservations, Fastpasses, etc. Here are some things you should know about Mobile Ordering at Walt Disney World. Check out Get Away Today to book your trip today! Quick Service Food Tool: In a nutshell, mobile ordering at Walt Disney World is an order and pay tool for quick service food locations. It’s designed to give you an option other than waiting in line. This is great when you want to make the best use of your time – or have kids who are hangry, so a food line isn’t ideal. Stake out the Dining Room: You can find your table and order without leaving until it is time to pick it up. Mobile order is not available at table service restaurants or at kiosks. Alerts From Mobile Order Restaurants: You can set up notifications in your My Disney Experience app so that you get an alert when you are in range of a meal or snack location that accepts Mobile Order. Turn on recommendations under Mobile Device Notifications On your profile. 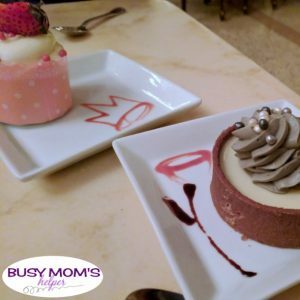 You Can Use the Dining Plan: If you are on a Disney Dining Plan, Mobile Order is compatible with that, so you don’t have to pay out of pocket if you have snack or meal credits. Otherwise, you need to pay with a credit card. Currently the tool is not equipped to take payment via the magic band or Disney Gift cards. Mobile Order Uses Your Location: Your food is not prepared until you are within a certain range of the location, so you don’t have to worry about the food going cold on the counter or drying under a heat lamp. Separate Pick-up: By using mobile order, you skip the line to order and pay. There is sometimes a line at the mobile order pick up and sometimes not. Order is Ready: You receive notifications after your food is ready, but you can usually pick up before the notification goes out. Be sure to have your app handy at pick up to answer any questions regarding your order. No Hotel Options Yet: Currently, mobile ordering at Walt Disney World is only available in the four major theme parks. Magic Kingdom offers it at several, including Columbia Harbor House, Pecos Bill Tall Tale Inn and Cafe, Casey’s Corner, Aloha Isle and more. Disney’s Hollywood Studios has Mobile Order at the ABC Commissary, Backlot Express, Rosie’s All American Cafe, and Woody’s Lunchbox plus others. Epcot only offers it at Liberty Inn in the American Adventure and Electric Umbrella. Animal Kingdom offers Mobile Order at Flame Tree Barbecue, Harambe Market, Satu’li Canteen, Restaurantosaurus and Pizzafari. Mobile Order in Disney Springs: The one location outside of the parks that currently offers Mobile Order is D-Luxe Burger at Disney Springs. But keep checking, because more restaurants are joining in all the time. What’s your favorite quick service restaurant at Walt Disney World? Save yourself some stress and be as prepared as possible for your Disney vacation. By following these helpful packing tips you’ll maximize your enjoyment and avoid some common drawbacks. Not only that, but knowing better what and how to Pack for Disney may even save you some money! Make sure you have cash in your wallet that you can use in a pinch to tip your driver, bell service, etc. This can save you from needing to use an ATM and possibly face those fees. In addition to that, bring plenty of Disney gift cards and the credit card you purchased your reservations on. It’s almost always hot, though it might get a little cooler on winter nights. There is a lot of walking involved, so comfortable walking shoes are a must. Please don’t be one of those people struggling in the parks in stilettos. To maximize comfort, wear shorts or a skirt (if you’re braver than me) and light breathable clothing. Formal wear is not a necessity if you are looking to pack light – however, for some dining reservations (like Victoria & Alberts!) you may need to get a little dressier. Remember to bring sunscreen and use it every day – don’t forget the back of your neck if you have short hair or will wear a ponytail! Nothing zaps the fun out of a vacation in the sun like getting burned. Ya, I’ve learned that the hard way. Pain reliever is also good to have on hand, versus paying extra for it when you get there. Consider any other toiletries, ointments, or remedies you might need in advance so you can avoid the upcharge later. You will need room in your suitcase to bring back souvenirs, of course. You can create that space and save money on water by packing a whole pallet of drinking water for the trip. It’s important to stay hydrated and you can get a 24 pack of bottled water for the price of a single bottle in one of the parks. By the end of the trip, water’s gone and there is room for all the t-shirts, plushes, and other awesome stuff you buy to commemorate your trip. Bring a cord and adapter for charging your phone overnight in your room. If you keep up on this you will not need to purchase or pack an external charger. The parks even have charging stations in case of an emergency. Small, travel-friendly backpacks can be your best friend – I don’t go to the parks without this one that’s been fabulous for 2 years! Don’t forget an umbrella and some disposable ponchos, especially if you are going to Disney World in the Summertime. Ponchos are one thing you don’t want to be buying last minute in the middle of a rainstorm, trust me! And definitely don’t forget your autograph books – these are the ones I made, complete with activities for during line waits. You can nab one here or on Amazon here! Check out our previous post on What to Pack for Disney for more specific packing tips! Are tips accepted in Disney World? Absolutely – but with exceptions. While some Cast members are required to not accept tips for the most part, there are some positions at Disney where customary tipping is expected. Those cast members are paid by Disney as tipped employees, which means they can earn up to $3 less than minimum wage. When you vacation in Disney World, be sure to bring enough cash to cover tips for transportation, certain hotel services, and food servers. Here’s everything you need to know about Tipping at Disney World! The following job types are classified as “tipped” and will gladly accept gratuity for their services. Drivers: Obviously, the taxi service, or ride share app you use takes tips, but don’t forget about the Mickey’s Magical Express driver. They are your first point of contact on your Walt Disney World vacation and they work hard to make the experience magical. They’ll appreciate the gratuity. Generally, have $1 or $2 handy per piece of luggage they store and retrieve for you. The drivers on the internal buses do not take tips. Hotel Services: Bell Service cast members are also tipped employees. Generally, anyone handling your bags will accept gratuity. The usual amount is $1 to $2 per bag. Salon and spa services are also tipped. Gratuity for massage, pedicure, etc. should be between 15% and 20% depending on the quality of service. Food Service: Servers at table service restaurants do accept tips. It is also customary to tip at buffet restaurants, but not counter service or kiosks. The average tip for food service is 18% of the bill before tax. The minimum suggested tip is 15%. Non tipped Cast members include: ride operators, custodial cast members, outdoor venders and basically anybody not mentioned above. They cannot accept tips unless they have refused up to three times. Even then, the tip is taken to management. The best way to recognize these people for doing an exemplary job is to request a Great Service Fanatic card. You can also call or email Guest Communications: 407-824-4321 wdw.guest.communications@disneyworld.com You can even tweet @WDWToday with #castmembercompliment to show them some extra love and recognition! Tell us your best experience with a cast member! If you’re a big Disney park fan like us – especially if you’re planning a trip there anytime soon – Disney’s Hollywood Studios, Animal Kingdom and Magic Kingdom all have new experiences to offer. Plus, no more plastic straws. Here’s the Five Top News Stories for Walt Disney World This Week – read on for details. Be Our Guest restaurant now offers a new, enhanced dining experience as of July 27th. They serve dinner as a three course Prix Fixe menu. The enhanced dinner menu is much more French. Appetizers include Escargot and Charred Octopus. Among the entrees are Saffron- infused Seafood Bouillabaisse, Center-cut Filet Mignon, and Poulet Rouge Chicken. End the meal with a delicate dessert trio. You can now get a special photo keepsake whenever you “drop in” at the Hollywood Tower Hotel. The lenticular photo changes to show you entering The Twilight Zone with a fun and eerie effect. Memory Maker packages do not include the keepsake, and it is not part of Photo Pass. You must buy it separately, and they do charge $19.95 plus tax. The new Disney Junior character will be joining the Disney Junior Play and Dine breakfast at Hollywood and Vine in Disney’s Hollywood Studios, beginning on September 30. Later this year, she will join the Disney Junior Dance Party at the park. Vampirina is an age appropriate cartoon about a vampire girl in a Munsters-like family who is making new friends in a human neighborhood and learning to celebrate her differences. Single use plastic straws and plastic drink stirrers will no longer be used at any Disney owned locations. This new commitment is part of an ongoing environmental initiative by the Disney Company. The change will take effect in the middle of next year. It is still unknown whether they will replace the plastic straws with paper, or charge for reusable straws. Don’t forget to check out Get Away Today to book your trip today! Right in the heart of the action at Dinoland USA, Restaurantosaurus has added a brand new lounge. Dinoland USA is a split American themed addition to Animal Kingdom that features dinosaurs in a campy roadside attraction setting, next to a science institute where time rovers study actual prehistoric creatures. Students at the institute live in on-site quarters that double as an elaborately decorated restaurant. That restaurant now has a lounge which offers snacks, as well as specialty drinks like Tequilasaurus and Primordial Booze. What other news stories for Walt Disney World are you excited for? When you buy a Disney World Vacation, you get a room and some park tickets. If you’re lucky, you get a free dining plan, as well. But for most people that’s it, and buying a dining plan is not a viable way to save money. During your stay, you encounter all varieties of tiered service options, price ranges and more. You can easily rack up a heavier vacation tab then you expected if you’re not careful. To help, here’s our Top 3 Ways to Cut Food Costs at Walt Disney World. This fall will be my first time ever trying the Disney Dining plan – and it’s only because we got the free dining special. As I was preparing our park plan and dining reservations, there was so much to look into – and I remember how hard it was figuring out a food budget in previous trips there. I don’t want you to have that stress, as well! So, here are three cost cutting measures you can take while on vacation in Disney World. Quick Service is a substantially lower cost way to dine in the parks at Disney World. The entrees are less expensive and there is no gratuity attached to the meal. So, immediately you save money when you choose counter service over table service. Even after that there are a few more things you can do to leverage the cost of your meal. 1. Drink ice water. Ice water is served for free. You don’t even need to buy anything. Keep that in mind when staying hydrated on hot Orlando days and definitely use this to your advantage when meal time comes around. 2. Purchase shareable entrees. Some quick service locations serve entrees that can easily be shared. It’s a great way to save on meals for guests with smaller appetites. Also, adults can order kids meals for themselves if they don’t want an adult size meal. Some kids check meals are very similar to offerings on the adult menus. 3. Toppings Bars. Some counter service locations have toppings bars. Pecos Bill’s Tall Tale Inn and Cafe is one example. You can augment the already sizable portions with as much of the toppings as you like with no added cost to you. You can even make a side salad out of it. It’s a thing. 1. Skip it (as far as eating out goes). Or bring small snacks from home to eat in the hotel room before you start the day. This will cut down on meals by 1/3. You can schedule your lunches earlier to help cover the difference. 2. Fill up. This is a good strategy if you are capable of loading on the calories in the morning and not having another meal until dinner time. If your accommodations include a continental breakfast this can really save you money. You can even pack away some snacks for later. Even a buffet, like one of many character dining experiences around Disney World such as Tusker House, can save you money. Of course that depends on how much you would be likely to spend on lunch, how much a smaller breakfast would be, and how that sum compares to the buffet price. There are pros and cons of planning. Planning is meant to make things easier. Life is unpredictable, though and sometimes plans fall through. So, be prepared to change your mind. Preparedness is good, like bringing water and snacks into the park to save money, or planning your next meal to stay on schedule. One thing you definitely don’t want to do is follow through with meal plans if you aren’t really hungry. When you have a reservation, it’s a little bigger of a deal and there may be a fee involved for cancelling, but generally speaking don’t spend money on food if you aren’t hungry just because it’s what you had planned. It might sound weird, but its really effective. When you get caught up in “we have to do this next” stop and ask yourself if it’s what you really want. This little thing can save hundreds of dollars over vacations for a few years. I hope you liked these tips and found them insightful. Was there anything you expected to find but didnt? What are your favorite ways to save money while you’re in Disney World. What tips do you plan to use? 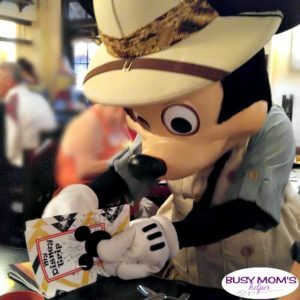 How do You Save Money in Disney World? Now updated to include Toy Story Land, opening June 30th 2018! Y’all loved our last Disney World Ride Lists, but with Toy Story Land opening at Hollywood Studios, we knew it was time for some updates. A few rides have switched up, so these are the most accurate we have at the moment. Don’t forget our popular Unofficial Disney Autograph & Activity Book for your trip! For great prices on your magical vacation, check HERE. We have a page for each of the 4 main Disney theme parks, sized at 8.5×11 – I highly recommend printing onto cardstock, and of course they look tons better in color! 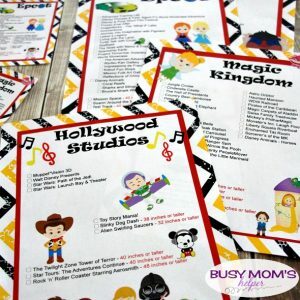 Click the links to download these free printable Disney World Ride Lists! There’s a little checkbox next to each ride/activity, and if the attraction has a height requirement, that’s listed out to the side in red so it stands out. You not only have an easy guide to which rides there area, but can check them off to see what you have left to complete! You can even highlight ones that are your ‘absolutely cannot miss this’, so you can tell at a glance what your priorities are for that park. Don’t forget our popular Unofficial Disney Autograph & Activity Book for your trip! Don’t forget to check here for great prices for your next vacation. Don’t miss the biggest update – Toy Story Land at Hollywood Studios! *We are not responsible for any ride availability, hours, refurbishment schedule, closings or height requirement changes. Check the Disney website for the most up-to-date information for your trip dates. Exciting news for my fellow Disney-lovers! If you haven’t heard, Pixar is taking over at the Disneyland Resort this summer! 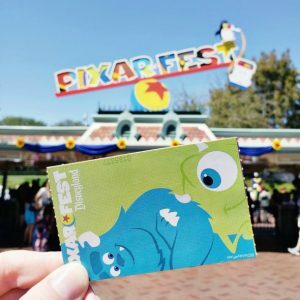 From now until September 3rd, you can experience Pixar Fest when you visit The Happiest Place on Earth. Here, you’ll be able to interact with your favorite Pixar characters, enjoy dazzling entertainment and celebrate Pixar like never before. Plus – on June 23rd – you can be one of the first guests to experience the re-imagined Pixar Pier and the thrilling Incredicoaster. With so much to do, you won’t want to miss your chance to experience it all. Because of this, I’ve partnered up with my friends at Get Away Today to give you everything you need to know about Pixar coming to the Disneyland Resort this summer. At Pixar Fest, you’ll be able to enjoy a variety of delightful entertainment that will take you to “Infinity and Beyond!” The first parade that you’ll want to catch is the Pixar Play Parade. This beloved parade has made a comeback for Pixar Fest, but is now in Disneyland Park for the first time ever. On Main Street U.S.A., you’ll be able to see characters from Monsters University, The Incredibles, Toy Story, A Bug’s Life and more. Plus, you can also enjoy new floats like the Pixar Lamp, Pixar Ball, UP and Inside Out. The best part? This is the perfect parade for a hot summer day. With all-new water features, that might just get you wet, you’ll be able to stay cool as you party with some of your favorite Pixar pals. You can catch the Pixar Play Parade daily at 3:30 P.M. and 6:00 P.M.
Another fan-favorite making its return for Pixar Fest is the Paint the Night Parade – my favorite! This nighttime show was instantly loved during Disneyland’s 60th Diamond Celebration, so I was ecstatic when I heard it was coming back for Pixar Fest. Here, you’ll be able to dance and sing along to catchy tunes with cherished Disney and Pixar characters. Each character lights up the night with thousands of LED lights on their floats, making it an unforgettable sight to see. On June 15th, you won’t want to miss your chance to see The Incredibles make their grand-entrance to the Paint The Night Parade. With new features – a little bit of magic – The Incredibles float won’t be anything short of super. This parade is enjoyable for people of all ages, so you’ll want to make sure you catch it before it speeds out on September 3rd, 2018. To end your Disney day the perfect way, you’ll want to make time to see “Together Forever – A Pixar Nighttime Spectacular.” With pyrotechnics, projections, music and scenes from Disney-Pixar films, you’ll be laughing – and maybe even crying – at this beautiful celebration of friendship. As a tip, you’ll want to make sure to watch this nighttime show from Main Street U.S.A., so you’re in the middle of all of the fun. “Together Forever – A Pixar Nighttime Spectacular” is a show you won’t want to miss. Ya’ll know I’m all about the FOOD, right? Well, in addition to the entertainment, you’ll be able to enjoy over 50 food and beverage options during Pixar Fest! These Pixar-themed treats are not only delicious, but worthy of their own Instagram post! With delectable eats like Cheeseburger Pizza, Three Flavored Corn Dog and a Cocoa Churro, you’ll want to make sure you save room for it all! Plus, you’ll be able to meet your favorite Pixar pals at Paradise Gardens. Say hello to Mr. & Mrs. Incredible, Mike Wazowski, Sulley, Woody, Buzz and more! In addition to the character meet and greets, be sure to enjoy colorful décor located throughout Paradise Gardens. Pixar Pier will include four new neighborhoods for guests to enjoy. Each neighborhood is themed after a classic Pixar film. Enjoy Incredibles Park, Toy Story Boardwalk, Pixar Promenade and Inside Out Headquarters. Each neighborhood will include attractions, food and fun for everyone to enjoy. While I can’t wait to see every detail of Pixar Pier, I’m most excited for the Incredicoaster. This re-imagined attraction has taken over for California Screamin’ and now features our favorite superhero family. This thrilling ride will take you on an adventure with The Incredible family as they try to rescue Jack-Jack after he escapes. With brand new effects, a renovated queue and an entire area dedicated to The Incredibles, I can’t wait to save the world the next time I visit Disney California Adventure! When you need a break from all of the fun, make sure you stop and explore one of the many new dining options at Pixar Pier. If you’re looking for a quick bite to eat, you can enjoy Poultry Palace, SeñorBuzz Churros, Angry Dogs or Adorable Snowman Treats. However if you want to have a unique dining experience, make sure to check out the Lamplight Lounge. With California gastro-pub themed food, you can dine right on the Pier. Plus, you’ll be able to enjoy Pixar-themed knick-knacks, drawings and sketches located throughout the restaurant. No matter where you choose to eat, you’re in for some scrumptious grub! If you haven’t booked your Disneyland vacation to experience the most “Incredible” summer yet, make sure you book with Get Away Today. With discount Disneyland tickets, hotel specials and a flexible Layaway Plan, Get Away Today makes vacationing more affordable than ever before! To book, visit getawaytoday.com or call 855-GET-AWAY to speak to a travel expert directly. Make sure to mention promo codeBusyMomsHelper to get an additional $10 off your next hotel and tickets vacation package. Despite having gone to Walt Disney World before, I didn’t make it to Club Cool at Epcot until my trip with hubby last fall. I’d heard people talk about it and was eager to give it a try myself – after all, how awesome is it to try different soda’s for FREE?! I’m all about trying things from other places, and here you can taste test sodas from EIGHT different countries, which is actually a really cool activity and experience. Not only that, but if you need a little drink then it’s great to grab one for free while passing by. There were actually several of them that were pretty good – not as good as my beloved Dr Pepper, but still good 🙂 Sorry for the shakiness of the video, it was a bit tricky going back and forth, filling the little cups while holding the phone. Hubby wasn’t too thrilled that I didn’t give him a heads up, but I couldn’t resist the surprise of it! The Beverly is totally gross – bitter is probably the best way to describe it, which isn’t how a soda should taste – but it’s really kind of a right of passage type thing. If you’re going to try them, please do give it a try just so you can say you did! The atmosphere was pretty fun in there, as well, and people-watching is fantastic because you can see other people’s reactions to the sodas. I’m so excited to take my kiddos here in the fall, not only to see their reactions (yes, I’ll film! Ha!) but to let them experience sodas from around the world, giving them a taste of something different and new. I love learning of other cultures and places, and sharing that with my kids is really important to me. So why not have some fun with it along the way? 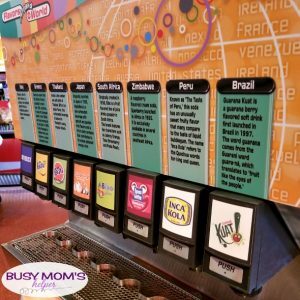 If you’ve done Club Cool at Epcot, which soda was your favorite? Even though Epcot at Walt Disney World seems to be best known for it’s World Showcase (and food – yum! ), it does have some truly amazing rides, Test Track being one of the most popular. During my trip with hubby last fall, we learned a little-known but very Fun Secret for Epcot’s Test Track that made the ride even better – and today I’m sharing it with you! First of all, for those that may not know, Test Track is a ride where you design a ‘test car’, then get in car simulators that go through different types of tests – such as efficiency, power, capability, and responsiveness – to see how your particular design would rate on it. There’s touch-screens for you to do your design, then it saves to your MagicBand for you to scan to your ‘seat’ before you board the car. Here’s a little secret – the design stays on your MagicBand for 30 days (or until you put a new vehicle design on it, so be careful)! Knowing this, we wanted to really design a great vehicle, but needed more than the super quick amount of time you’re allowed at the screens in the normal line. That’s where the bigger secret comes in – there are those same computers after the END of the ride that you can use, without being rushed as much by a line! That’s right, after you exit the ride and pass by the show cars, to the right are 3 or 4 stations where you can do your design with much more attention and detail than in the actual ride line! We had a BLAST with this, designing some awesome vehicles and then riding Epcot’s Test Track to see how they’d score with each of the categories. Hubby focused more on power – his looked like a beast of a truck! Knowing this and telling our kids about it for our upcoming trip, they’re super excited to make their own designs (and I know they’ll take time, so those other stations will be a huge life saver) and test them out. I bet we’ll be redoing it quite often, which will be for some fun memories. What type of design would you do for Epcot’s Test Track?